Along with many other Walkers, I headed north from Hunters Hill Village and down the long slope of Reiby Road to the Lane Cove River. Crossing the river was the sixth bridge of the Walk, the Fig Tree Bridge. 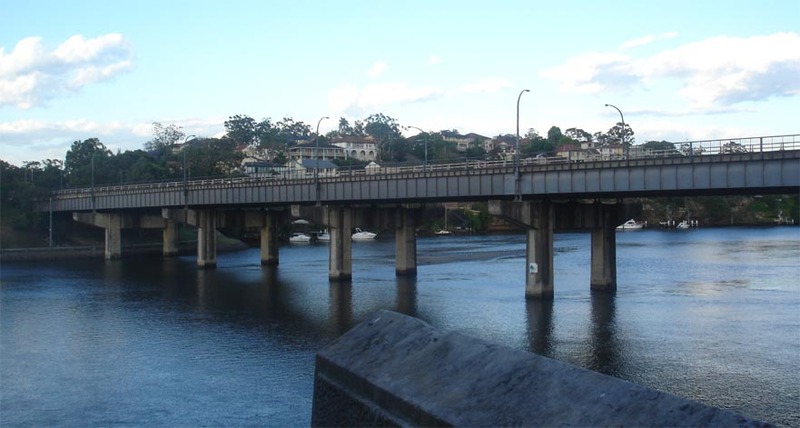 Barely 10 minutes after leaving Hunters Hill Bridge, I got my sixth Bridge stamp. The last bridge was about 12 kilometres away. Shortly after the Fig Tree Bridge, I entered the very pleasant riverside suburb of Linley Point. The Walk’s path took us through leafy streets and around the northern shore of Burns Bay through the Burns Bay Reserve. It was very pretty, quiet and tranquil. …and as I followed that curve it continued to rise steeply. Once again I began pumping my deep-breathing bellows and told myself to take it steady and don’t rush, but my now-aching legs wanted to speed up in protest and just get up this damn curving slope. What didn’t help my mood were loud groans and protests from several of my suffering co-Walkers, and especially a series of hand-written signs announcing a rest-stop not far away. I rounded the curve and Riverview Street continued to rise northwards. …but it felt more like 100 kilometres. Finally, though, as Riverview Street curved east again I reached the top of that hill and the Earth became flat again. And then I saw a glorious sight. It was the rest-stop, an unofficial one just within the gates of the Saint Ignatius’ College boys school. But it was glorious not just because it was a rest-stop. Unlike the previous crowded Villages and other rest-stops with little seating and protection from the blazing sun, there were few people there and many empty chairs underneath a few marquees. I pulled into the rest-stop where not only were there drinks for sale but also $2 bags of mixed lollies (candies/sweets). I happily bought two bottles of water and a bag of lollies, grabbed a chair and sat down. And there I relaxed for the next glorious 30 minutes, savouring my water and lollies and giving my aching legs a much-deserved rest. As I sat there, I listened to what other resting Walkers around me were saying, and watched others continue past along Riverview Street to the east. As a few of my resting co-Walkers commented, the previous crowds were now thinning out. At the same time, the variety of Walkers was still amazing to behold – especially one young woman who went past. She was wearing a long-sleeved top and long pants. And a rainbow-striped plastic top-hat, and rainbow-striped leggings over her calves. And, most of all, a long red velvet cape labelled with THE MISTRESS OF AWESOME in large silver letters. At 2:15pm, after binning my litter and going to a nearby toilet, it was time to resume the Walk. I returned to Riverview Street and headed east, and this time down a long and pleasant slope. About 15 minutes later on Carranya Road another hill appeared, but fortunately it was short and straight unlike that treacherous winding slope further back. Soon, I was heading north along Warraroon Road with the Warraroon Reserve to my right, and for a while there was only myself and a few other Walkers. As I approached the intersection of Warraroon Road and River Road Rest, I was struck by the powerful and wonderful aroma of the trees at the northern end of the Reserve. And as I turned south-east onto River Road West, a large group of Walkers suddenly emerged from the trees and joined me on the footpath (sidewalk). Unfortunately, the next hundred metres or so along River Red West was another bloody sharp slope, but I mentally gritted my teeth and deep-breathed again to continue on. Soon after that slope, the Walk’s path took us off River Road West and through more surburbia to Lane Cove Village where I got my fifth Village stamp. I had walked about 20 kilometres to get there. There was just over seven kilometres to go until the end of my walk at the southern end of the Sydney Harbour Bridge. Could I still make it there in time by 4:30pm? I put some fresh gum in my mouth and resumed my Walk. And very soon, I would find that this last part of the Walk would be the worst. This entry was posted in Hope, Life Challenges, Travel. Bookmark the permalink.